Today I’m in Manchester, joining the celebrations of the centenary of some women gaining the vote. I hope you get a chance to celebrate too. My day will start with filming for the BBC’s ‘Emmeline Pankhurst: making of a militant’, inside the former Free Trade Hall, a significant site for the Suffragettes. And my day will end at the Pankhurst Centre, with the launch of ‘Deeds not Words: the story of women’s rights then and now’, the new book by Emmeline’s Great Granddaughter, Helen Pankhurst. There will no doubt be some exciting activities in between. In the lead up to the 6 February you have probably seen lots of interesting features on the Suffragettes and their legacy. 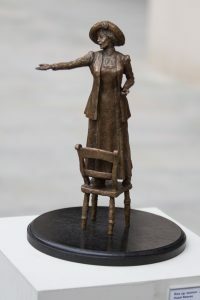 There has been great interest in the Emmeline Pankhurst statue over the last few weeks – the BBC South East team filmed a feature at my studio; BBC Breakfast did a short feature on three forthcoming statues – of Emmeline, Alice Hawkins and Millicent Fawcett; BBC Radio Sussex interviewed me; and we’ve had articles in the Guardian and The Daily Telegraph recently. 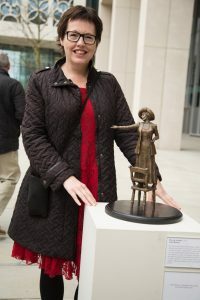 Also, listen out for “30 on 30” on BBC Radio 3 Breakfast show, where I talk about my favourite woman composer, along with 29 other women, between the 6 February and International Women’s Day. 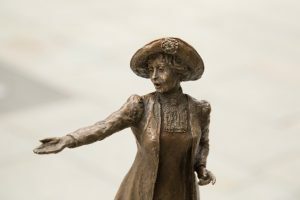 This media interest all helps to get the word out – on the centenary and on Emmeline’s profound role in women’s journey towards gaining the vote and gaining their citizenship. While it is important that we celebrate the progress on women’s rights over the past 100 years, we must also recognise how much work there remains before women achieve equality.